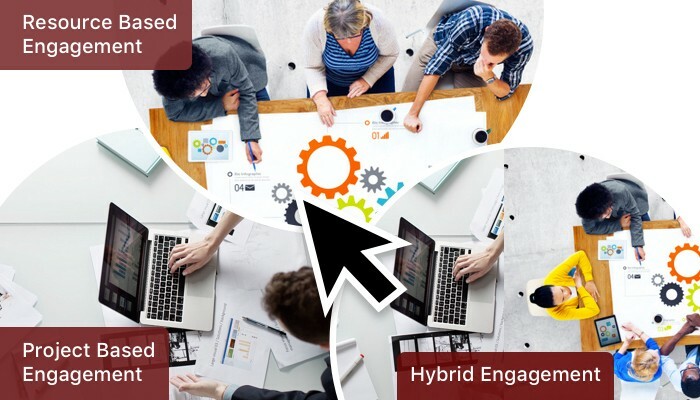 Home » Blog » Which Engagement Model is Best When Selecting Software Vendor? Do you want to cut cost but don’t want to compromise on quality? Are you in process of searching a software vendor that met your needs. Do you want to select best engagement model for your next software development project? Do you want to hire a software vendor that understand your needs and contribute actively in process of custom software development? Take a look at our guide to understand which engagement model is best when you are selecting software vendor for your next software development project. Just like every other partnership, developing a software is also a two-sided job a good software vendor and right client. So, client can easily hand over the custom software development needs to the software vendor who work as an outsourcing partner and software vendor suggests a best engagement model that creates win-win situation for both client and a software vendor. In simple words, engagement model is a future of client-vendor relationship. It is a framework between client and software vendor for responsibility, level of control and flexibility. There is no universal engagement model for all software development needs, every requirement requires different engagement model. We suggest our clients to select choose engagement model based on requirements. So, before deciding engagement model with a software vendor ensure you have provided all your detailed requirements to the software vendor. There are many experienced software vendors who have an enough skill and knowledge on how to gather software development requirements from a non technical clients. Best pricing model for your requirements ensure that outcome software vendor deliver would be the best in all sense. Decision on engagement model is depended on various factors like maturity of a software vendor, working methodology of software vendor, track record of software vendor, customers pervious experience but more depend on requirements of project. Software vendor offer several types of engagement model based on custom requirements but there are three basic and popular engagement models Time and Material, Dedicated Team and Fixed Price. Take a look to guide. It is more known and popular as cost effective engagement model, it is working as amount of money provide software vendor deliver the work accordingly. In this model, client and software vendor deiced the hourly, daily or weekly rate before the allocated resource start the work. It is a flexible model and deadline in this model not negated so don’t take it that way and clients work is supervised by experienced project managers. It is good option to get work done in budget and time. 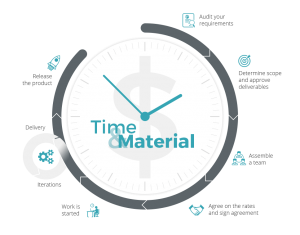 With Time and Material model bugs van be caught early and cost is constantly in observation of client. Software development company located onshore, offshore or nearshore all provide dedicated team model. 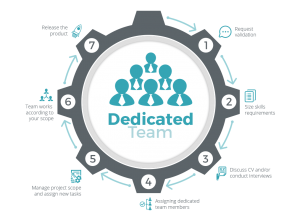 Dedicated team is your virtual team working as an extension of your inhouse team and increase inhouse your development capabilities. While you have a large size of requirements and you know what qualifications software engineer need but not sure for how much period while you outsourcing your development work to software vendor dedicated model works perfect. Software vendor you hire would provide you team of the dedicated resources for right time. Dedicated team model is simplest outsourcing engagement model from software vendors. It is engagement model best suitable for long lasting project and long-lasting business relation. Fix project scope, application or product requirements and fix deadlines with software vendor and they will provide you fixed price. But, remember this model would not get success without initial planning, estimation and analysis sessions though these efforts are time consuming and tedious but still gives a desired result for you. Success of fixed priced model is much more depends on initial phase of analysis and assessment of project requirements. Slight change in the software development requirements leads toward dispute in the client and a software development company. This is a reason why selection of software development vendor is important. Signs to know software development company is focused on quality is subject of discussion but is software development vendor is focused on quality they will make custom application development fast and less expensive. 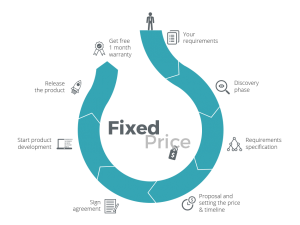 Fixed price model is beneficial for client as they have predefined budget and at the end of analysis they have an approximate cost estimation. If scope is not changed during the development cycle cost would not vary. In fixed pricing model for better control client would do a milestone based payment. A client and a software development vendor agreed one the milestone in the initial phase and client is billed accordingly that. This approach helps to minimize the risk for client and software vendor both. But remember early discussion and initial phase is extremely important in fixed pricing model. Whatever engagement model you select but software vendor going to work on your requirements is most critical. Best software development companies like Data Cross Solution assists clients in a proper way and create win-win situation for both the parties. If software vendor get success in creating this situation under any engagement condition that software vendor is good for you work. Whatever engagement model you select consider longer prospect. Even if you are sure it will take no more than two weeks during development process new opportunities arise that may delay or put your product early in the market. You can always contact us to discuss your software development requirements and our experts are stands with you.